I was hesitant about purchasing this amp for a couple reasons which we won't get into let's just say I'm a older guy that was in high school when bumpin started. However, it would seem Boss has bettered themselves over the years. I had a new set of Alpine Type R 12's sitting here to go into our Dodge Neon budget project car (most bang for your buck) build. I was looking at going with a Brutus or a Zeus due to some sick systems we have put together with them and the Alpines can handle it. But budget build required us to come in below a certain number and some things had to be sacrificed....or did it? I went with this amp and the proof is in the pudding. First run after install it knocked the rearview mirror off the windshield with no signs of distorting....and all I could do was smile. Honestly, I had a kenwood 400watt max amp installed in my car before buying this. Let me tell you, they sound EXACTLY the same. I even bought it 1,000 watt subs to be able to handle the power this amp puts out but I'm honestly really disappointed. That's what I get though. Save your money, but something a little more expensive, and it'll hit hard and sound better overall. I was skeptical at first to buy this amp, but thankfully eBay has its own ability to review now. I figured $70, lets give it a try...its very lighweight, so it has a cheap kinda feel to it..but...it does pack some power! I wired this up to 2 old school 4 ohm Audiobahn 12's bridged to 2 ohm's, 3/4 gain and Im surprised about how well it pushes them! No youre not gonna win any sound competitions but Im gonna grab another 1 of these and wire 1 to each sub bridged at 2 ohms and Im 100% sure its gonna hit even harder! 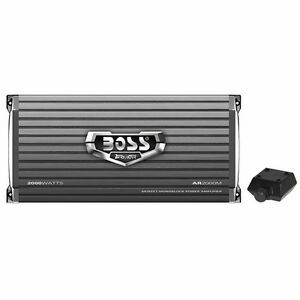 Best bang for you buck...not even close to 2000 watts, but definitely closer to the 350-400 range bridged at a 2 ohm load... Btw, best price on this amp from this seller, and they ship very fast..get this amp here! Great amp works good and was easy to install. Would definitely recommend. I have two 12' subwoofers and they sound great.